Gifts from the Pirates: "Would you do it for a Scooby Snack?" Like a true old timer, I have just been standing outside the house talking to my neighbour about how we never did anything for Halloween as children. I don't EVER remember going trick or treating or decorating the house and as we stood there draping spooky lights over our hanging baskets and getting things ready for the kids to carve pumpkins and make Halloween spiders, I thought how much this time of year has changed since way back then. I do love decorating the inside of the house every year, the boys get excited and it is one of the many things that I look forward to doing as a family each year. The shops are getting better each year making it easier to pick up decorations etc but the one thing I don't like (and it may make me sound like a grumpy old man), is the costumes aimed at young children. Do children of the boys age really need to look like half of their face is missing or that one of their limbs has clumsily dropped off. last year I asked the little girl that lives next door what she was dressing up as and she said "zombie red riding hood with blood dripping from my eyes!" Ewww! Thankfully the boys aren't really into the 'Frightening' side of Halloween and Opeie went for a full on cute approach to the All Hallows' Eve celebrations after a fun package arrived through the post last week. Scooby Doo was one of my favourite shows as a kid (until that scrappy appeared anyway) and I can't believe he's still going strong, but even more crazy is that he has now been immortalised in my favourite brick and has even starred in his own LEGO movie too! Clearly the lovable pooch is here to stay. 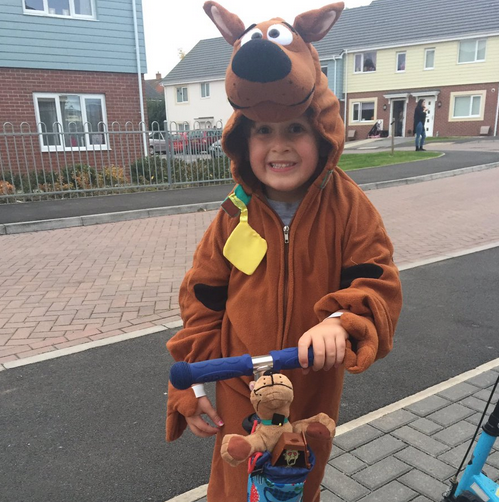 Opeie has been keeping his awesomeness alive this week by virtually living in a Rubies Scooby Doo costume that he got for Halloween. 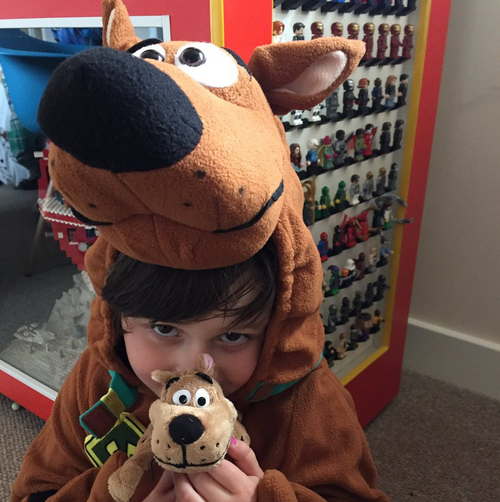 Mini Scooby Doo has been everywhere with me and surprisingly has been great entertainment for the older folk in the supermarkets. He's been making people smile everywhere we've been, especially because of the mini Scooby Doo he's been carrying under his arm too. 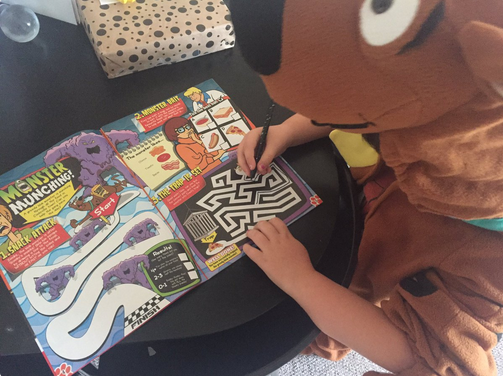 There's no surprise at all that because of this new Scooby skin that he has acquired, it has been a pretty Scooby Doo heavy kind of a week, Episodes, Books, LEGO and Magazines. It's been touch and go a few times whether we were actually going to get him out of the suit for bed. Part of me is a little jealous that I can't just dress up as a character I love and pop to the supermarket to get bread, I guess I'll just have to continue being his less interesting side kick. Whatever you've dressed up as this year, I hope you've had an amazing Halloween.